According to Richard Osmer, practical theology is an approach which has four tasks, each of which pursues answers to a particular question: The descriptive-empirical task asks “What is going on?” The interpretive task asks “Why is this going on?” The normative task asks, “What ought to be going on?” The pragmatic task questions “How might we respond?” These four tasks and questions fit loosely with the structure and movements of Mission-shaped Church, which flows from contextual and descriptive analysis, through theological themes, to constructive proposals. 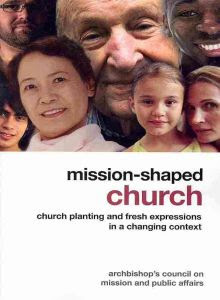 In this perspective, Mission-shaped Church can be seen as a practical theological report on the practice of church planting in 21st century England. Chapters one and two of Mission-shaped Church describe recent shifts in English society, as well as historical developments and ecclesial experiments. In chapter one, the council seeks to describe changes in the context in which the Church of England is engaged in mission and ministry. Several social trends are identified, including more and smaller households, more women in the workforce, longer work hours, increased mobility, increases in divorce and singleness, and the dominance of television among leisure activities. Of great importance, also is a shift in the nature of community, away from a structure of relationships based on geography toward a network-based one. For community in a network society, place is secondary and relational connections through leisure and work are primary. Mission-Shaped Church goes on to describe the prevalence of consumer culture and the arrival of post-Christendom as key characteristics of early twenty-first century England.